As thoroughbred racing’s triple crown chase gets under way, Bates is already celebrating a triple crown of its own. As the Class of 2015 admission cycle hits the home stretch, Bates is reporting significant gains in three areas that reflect institutional strength in the higher education market. 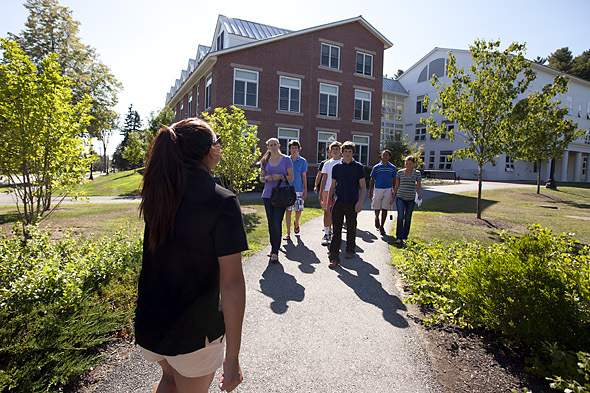 Bates received a record 5,196 applications — a 15 percent increase over last year — from prospective first-year students, topping the previous record of 5,098 set in 2008. Bates achieved a more selective acceptance rate, admitting just 26.9 percent of applicants (1,397). It’s among the most competitive admission cycles in Bates history and nearly 5 percentage points more selective than 2010. Bates received deposits from 37.5 percent (524 students) of those accepted, a 2.9 percent increase from last year and the highest “yield” in six years — a key signal of Bates’ desirability among students and families. “The surge in interest indicates that in a highly competitive field of top private liberal arts colleges, the message is out that Bates is one of the best,” said Dean of Admission Wylie L. Mitchell. Bates achieved a similar triple crown of gains in 2000, when the era’s economic boom was at a peak. “Achieving similar gains now, in a time of continued uncertainty, tells many people that Bates is continuing its long tradition of excellence and remains an institution that inspires trust and hope,” Mitchell said. James Hughes, the College’s Sowell Professor of Economics and chair of the Faculty Committee on Admission and Financial Aid, touched on the high quality of the Bates admission process and the great promise of the entering class. “As a faculty member, it was a thrill to witness and be part of all of the hard work, care and diligence that went into recruiting, evaluating and attracting the talented and diverse individuals that now comprise the Class of 2015,” he said. As of May 10, the number of incoming students is 524, though traditional “summer melt” will likely bring the number closer to the College’s target of 500. The figure includes 103 U.S. multicultural students, up from 86 last year, a number that itself represented sustained improvement from prior years. The incoming class also includes 31 international students. The class is 27 percent U.S. multicultural or international, the highest such percentage in Bates history. The Class of 2015 includes 53 students from Maine, consistent with prior years. More students than ever will come from the U.S. West (60), while 24 are from the South, 19 from the Midwest and the balance from the Northeast corridor. The gender breakdown is 269 women and 255 men. The 2 percent difference in gender is the smallest in recent Bates history. In the end, says Acting Director of Admission Leigh Weisenburger, the Bates admission program is successful because it’s more about people than numbers. By the time the Class of 2015 arrives in August, major work to restore and expand two major campus buildings, Hedge and Roger Williams halls, will be finished. The two buildings, both at the heart of campus, will house a range of academic programs, from languages to environmental studies. In expressing an early welcome to the Class of 2015, Weisenburger pointed to an acceptance letter written by the late Dean Emeritus of Admissions Milton Lindholm ’35 many years ago. “His simple words are still relevant today,” she said.